Few birds are as ubiquitous in the United States as the American Robin. Found in all fifty states except for Hawaii, the robin is also the state bird of not just Connecticut, but Michigan and Wisconsin as well. 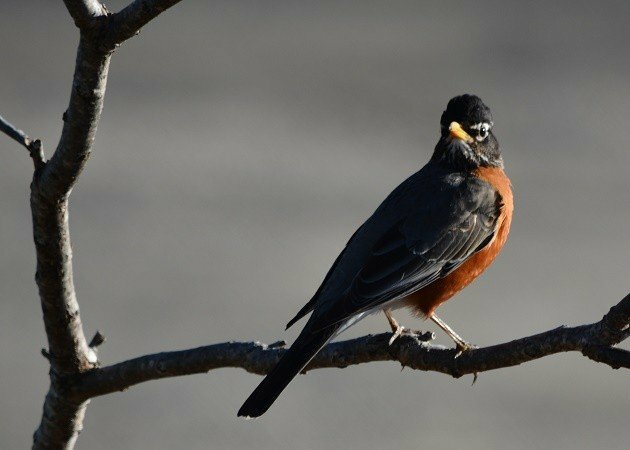 Long a symbol of spring in New England (even though they can be present throughout the winter), the robin was named Connecticut’s state bird in 1943. American Robins, with their bright red breasts and bellies, were originally named due to their superficial resemblance to the European Robin, though the two are not closely related. The American Robin is the largest of the North American thrushes, and are the root of the “early bird gets the worm” quote, which references their proclivity for yanking worms out of the ground. In fact, they are one of the few avian species that can survive on classic American lawns, perhaps explaining why their range is so large. Still, this leaves them more vulnerable to pesticides compared to many other species. As aforementioned, there may be many robins present during the winter months (winter roosts can reach over 200,000 individuals! ), but they remain in trees, where they are more difficult to see. When the ground thaws, they return to lawns and other open areas, creating the illusion that they have just arrived! Robins are prolific breeders, capable of producing not one, not two, but three broods in one summer season. However, less than half of the robin pairs that nest successfully fledge young, and only one in four of those that do fledge will be alive come November. Think those that survive until winter are the lucky ones? Think again, only half of those will make it to the spring. Given these grim statistics, it’s even more impressive that the oldest recorded living robin was over 14. Populations of American Robins are robust to say the least. There are over 300 million worldwide, and in many areas their numbers are on the increase. Looks like these birds will remain symbols of Connecticut, Michigan, and Wisconsin far into the future! Robins, as common as they are, are downright awesome. In June this year, I found an active Robin nest halfway out the coastal plain of the Arctic National Wildlife Refuge. The nest, containing 4 eggs, was just a foot off the ground in the tallest vegetation for miles, a three foot-tall, scraggly willow. It was probably only 15 miles as the crow flies to the coast of the Arctic Ocean. To call them adaptable would be a wild understatement. Thanks for reminding me of that!